1. The MLB announced that Facebook will have exclusive rights to 25 afternoon games. This means that there will be no local TV coverage for either team. Two Blue Jays games will be affected by the move April 18 vs. the KC Royals and May 24 vs. the LA Angels. The MLB is assuming all baseball fans have access to a computer and Facebook. In light of the recent data scandal on Facebook, many Facebook users are deleting their accounts. Also, not every fan has a computer either, especially the older generation of fans. I think the MLB should have made viewable on Facebook as an option, as opposed to a forced choice. The May 24th game will be especially tough for Blue Jays fans to miss as it will be their first glimpse on Japanese import Shohei Ohtani. 2. It was great to see Josh Donaldson return to the field at 3rd base. He had been dealing with a dead arm that affected his ability to make a strong throw to 1st base. JD is in a contract year, so will be looking to have a big year in order to cash in on either a new deal with the Blue Jays or the open market in free agency. He is also one of the players the Blue Jays will be relying on to spark the offence. 4. To start the season, Devon Travis and Russell Martin are on 2 days on, 1 day off playing schedules. Both players have dealt with injuries the past 2 seasons. Martin is also 35 years old, meaning regular rest will be important to keep him fresh at the end of the season. Devon Travis is struggling at the plate to start the season and the temptation will be to play him more to allow him more AB's to get out of the slump. Toronto might want to consider DH'ing Travis on some scheduled days off to get his bat going. 5. The New York Yankees are facing early injury troubles. In the opening series vs. the Blue Jays, Aaron Hicks went down with a strained intercostal muscle on opening day. Game 3, his replacement, Billy McKinney was hurt slamming into the Rogers center wall attempting to catch a flyball. On Friday, the Yankees lost another 4 players to injury: CC Sabathia left his start after throwing 53 pitches with a sore hip, catcher Gary Sanchez cramped up in his calf, Brandon Drury exited the game with a migraine and closer Aroldis Chapman left after not being able to warm up properly. The Chapman injury is a direct reason why the mound visit stat is so detrimental to the game. Infielder Tyler Wade is also battling flu-like symptoms. The Yankees depth will be tested and they may regret not signing/trading for a veteran player or two. New York was an early season favorite in the AL East. 6. The need for technology that calls balls and strikes came up in the Nationals/Mets game on Saturday. As long as umpires call the game, ambiguity will exist in baseball. Managers can challenge anything but balls/strikes. Strike zones can vary game to game depending on who calls the game. Some umpires have wider strike zones, other umpires have smaller zones. The inconsistency can affect the outcome of the game as pitchers/hitters figure out what is a strike vs a ball. If technology existed that was 100% accurate on if a pitch is a ball or strike, the game would be more consistent and the outcome would be true. TV viewers can see where a ball enters the strike zone. Evidently, technology is being developed to track balls/strikes in real time and accurately. It would definitely be tested at the minor league level first and would need player approval before being implemented. 7. Japanese import Shohei Ohtani is looking like he's for real. He homered in three straight games this week, including an opposite field shot against Corey Kluber. On the mound, he pitched pitched a perfect game into the 7th inning on Sunday on the strength of 10 strikeouts. Ohtani is the early season favorite for at least the rookie of the year award. Blue Jays fans will get their first glimpse of him May 22-24 when the Angels visit the Rogers Center. It is unlikely Ohtani will pitch in the series as the Angels are starting Ohtani once every 7 days. He'll DH most of the other games. 8. Early season surprise team: Pittsburgh Pirates. They were the last undefeated team in the majors. They have proven to be a force offensively early. Corey Dickerson, Colin Moran, Jordy Mercer, Josh Harrison, Josh Bell, Adam Frazier and David Freese are all batting over .300. This is the Pirates best start since 1976. Can they keep the pace up? Pittsburgh has a favorable schedule this month. They face the Cubs, Cardinals and Rockies, who should be in the playoff mix. They also face the Marlins, Phillies, and Tigers, who are not expected to contend for the playoffs. They should be able to win more games than they lose the rest of the month. 9. Early season disappointing team: Texas Rangers. The Rangers, who the Blue Jays faced this weekend, are struggling to get their starting pitchers to pitch deep into games. Only Bartolo Colon, Martin Perez and Cole Hamels have managed to pitch into the 6th inning. This is taxing the bullpen early on. In Friday's opening game of the series, Matt Moore threw 20+ pitches in the first inning and was gone with one out in the 4th. His replacement Jesse Chavez was forced to throw 26 more pitches to get the final 2 outs. Texas needs to get more out of their starting pitchers or it will be a long season. 10. 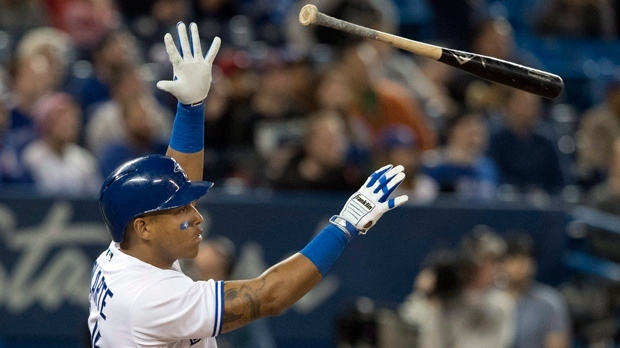 Blue Jay of the week: Yangervis Solarte. The off-season trade acquisition from San Diego had a solid week with 7 hits in 13 AB. He also drew at least one walk in every game this week and helped the defence turn some big double plays.